The semi-arid country of Northern Kenya, framed by volcanic mountain ranges and dotted with lakes, each unique. 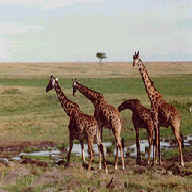 Throughout the region, rare animals abound; the Reticulated Giraffe, Beisa Oryx, Grevy's Zebra, and long-necked Gerenuk. Adjacent to this area is the beautiful Meru National Park home of Elsa the Lioness befriended by Joy and George Adamson and featured in Joy's Book and the film, Born Free. 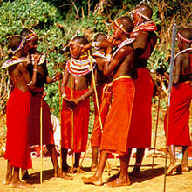 On the fringe of the hot and sparsely populated northern region of Kenya lies a small oasis, the Samburu Game Reserve. Samburu and Buffalo Springs provide a different face of Africa in a hot semi-arid desert area, before the true desert stretches away to the north. It is a favorite spot for many returning visitors to Kenya. There are a number of unique wildlife species rarely found elsewhere in Kenya: the Gravy zebra, the Beise oryx, the blue-shanked Somali ostrich, the reticulated giraffe, and the shy, long necked gerenuk (the antelope giraffe). Distinctive hills and mountains, interrupted by the Doum Palms, characterize the area where the lifeline for human and animal inhabitants is the sluggish Ewaso Nyiro River, with its large population of hippos and crocodiles nestled along the shady river edge. Shaba National Reserve is adjacent to Buffalo Springs Game Reserve immediately across the river. This was the home for many years of the authoress and naturalist, Joy Adamson, and her beloved lioness, Eisa. Further to the north is the Chalbi Desert. Beyond that is Lake Turkana known as "The Jade Sea". On its eastern shore, at Koobi Fora in Sibiloi National Park, fossils relating to the origin of man were discovered. Meru, to the south, contains the widest range of mountain landscapes and wildlife habitats. This was the home of Elsa, the lioness whose story was told in the book and subsequent film, savanna, Free. With its forest, swamp and savanna, and fifteen rivers, Meru contains a wide variety of wildlife, in huge quantities, including all the Big Five - elephant, rhino, buffalo, lion and leopard. 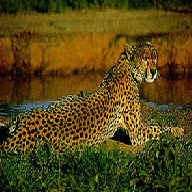 Samburu National Reserve lies 325 km north of Nairobi in the hot and arid fringes of the vast northern region of Kenya. The Reserve is within the lands of the colorful Samburu people, close relatives of the Maasai, and harbors a number of wildlife species rarely found elsewhere in any numbers. These include Grevy's zebra, the reticulated giraffe and the Beisa oryx, all species found only north of the equator. The long-necked gerenuk is a graceful antelope which spends much of its time in a bi-pedal stanceseeking succulence among the withered scrub which dots this harsh terrain. Scenically and faunally dramatic, for most of the year Samburu is sere under the unsympathetic equatorial sun. But relief comes from the wide swathe of the Ewaso Ngiro river which rises some hundreds of kilometers to the west on the foothills of the Aberdares and which vanishes beyond Samburu in the recesses of the Lorian swamp. The river is at its best in the Reserve, broad and sluggish with a large population of crocodile seen on sandbanks at almost every bend. In the lower reaches, where permanent pools have formed a tributary joining the river, are hippo. The river is fringed with giant acacias, figs and doum palms all of which provide shade and sustenance to the wildlife which comes to water. Elephant roam the gaunt hills which punctuate the scrubland and where occasional clusters of the vividly colored desert rose challenge the arid surroundings. These elephant seek solace and contentment in the shallow waters of the river and from time to time a visitor finds herds bathing and drinking in a spectacle of unconscious pleasure. Buffalo Springs National Reserve is separated from the Samburu Reserve by the river; less hilly and less dense than its neighbor it is equally as attractive. The Reserve takes its name from an oasis of limpid crystal clear water at the western end of the sanctuary. In addition to the wildlife found in Samburu the common zebra is also an attraction often marching with it's cousin the Grevy, although they do not interbreed. An unexplained phenomenon is why the common zebra is not found on the north side of the river. Birdlife, too, is prolific with the Somali ostrich dominating the plains. Larger than its southern relative the Maasai ostrich it is more easily distinguished by its indigo legs and neck. Next in size is the kori bustard who stands a meter high. His behavior is unpredictable, at times running or crouching at the first sign of danger and at others completely fearless of humans. The male has a remarkable display inflating his neck and neck feathers until the head seems to disappear then raising his tail until it lies along his back.